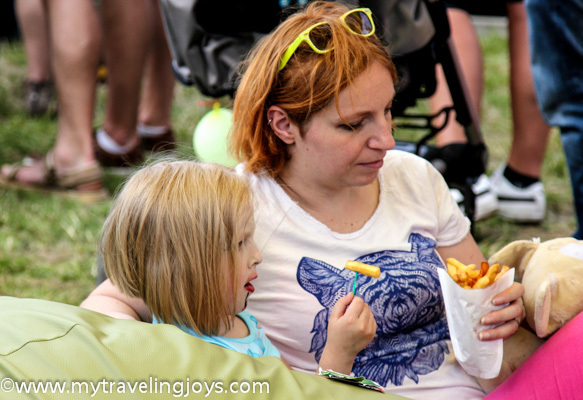 Yesterday, I took two buses and waited in line under the blazing sun for more than 75 minutes to get a bacon double cheeseburger at the Warsaw Street Food Festival. 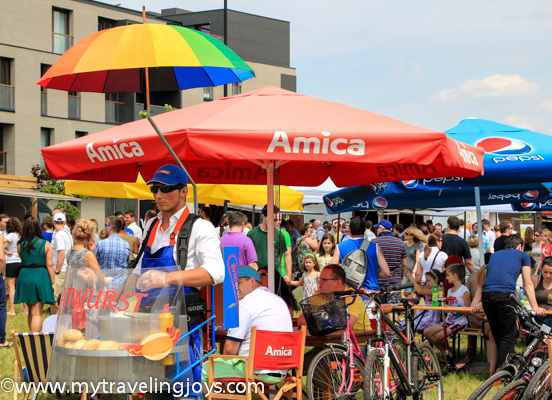 The burger was good, but I was slightly disappointed in the city’s first street food festival hosted by local Polish chef Tomasz Jakubiak in the upscale neighborhood of Wilanów. 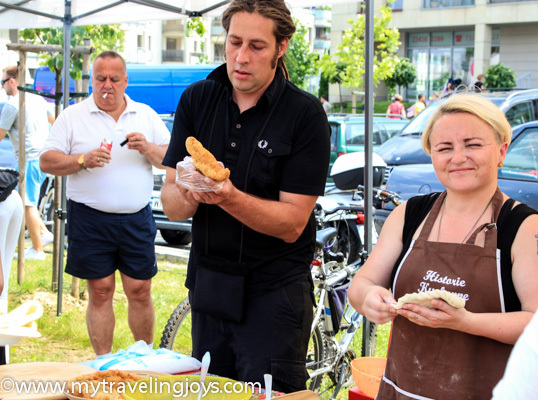 Last week, I heard about the event via Warsaw Foodie, a fabulous foodie blog that sends out daily emails to subscribers about restaurants opening or closing and local foodie events. This event sounded perfect for me! 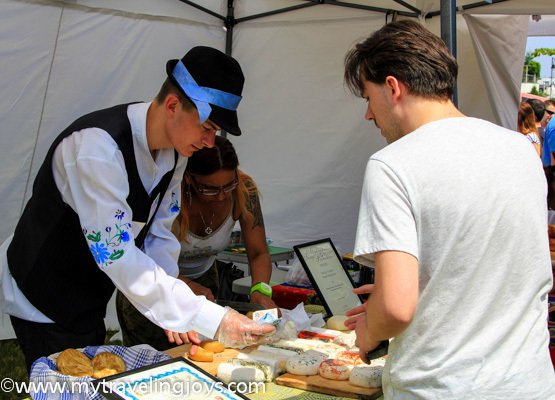 I’ll give credit to Jakubiak for trying to promote Polish food and local vendors. 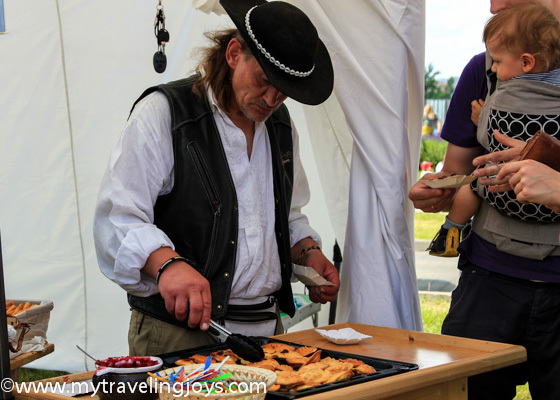 Apparently, he hosts a popular cooking show on the local cooking channel kuchina+ called “Jakubiak Lokalnie (Jakubiak Locally).” Jakubiak travels around Poland in search of the best and sometimes forgotten seasonal ingredients from Polish farmers and demonstrates recipes inspired from said ingredients. 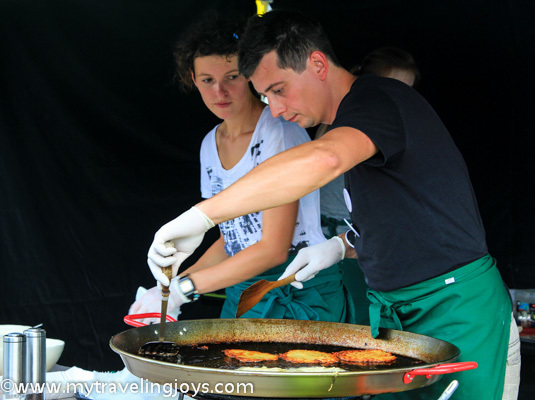 It seems like street food trucks and burgers are the latest craze here in Warsaw. This American trend is quickly catching on as every other week I hear about new food trucks and burger restaurants around the city. The latest burger place, Yellow Taxi, just opened last week near our neighborhood in central Warsaw. 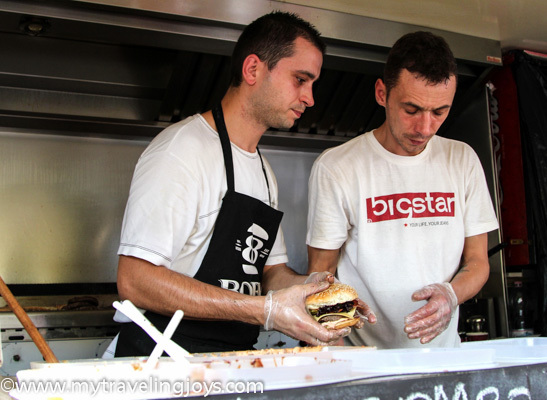 The two busy cooks at Bobby Burger's truck stand at the Warsaw Street Food Festival. My delicious bacon double cheeseburger that I wolfed down in like five minutes after standing in line forever. The foodie festival would have been more fun with friends, but hubby is out of town for work and I don’t know many people yet so I went solo. I also wish there was a beer tent. Apparently, I missed the memo about BYOB as many youngsters were bringing beer with them, perhaps from a nearby convenience store. Sigh! At least, I got myself out there. 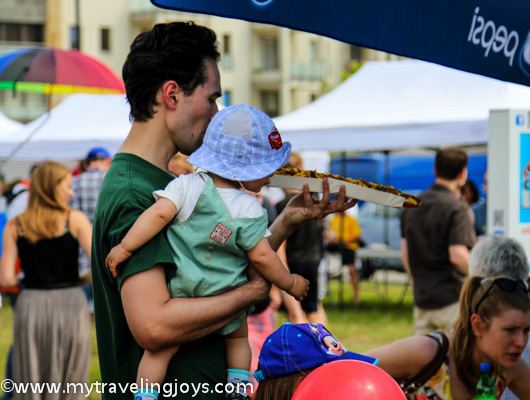 I did enjoy walking around the tent-speckled park checking out the different food vendors and people watching in my new city. 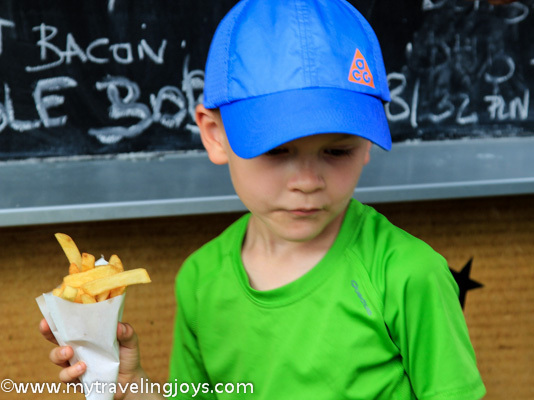 The vendors included Bobby Burger, Town Burger, Cheeseburger Slowfood, Zapiekanka Snack Bus, baked potatoes from Groole and sausages from Wurst Kiosk. 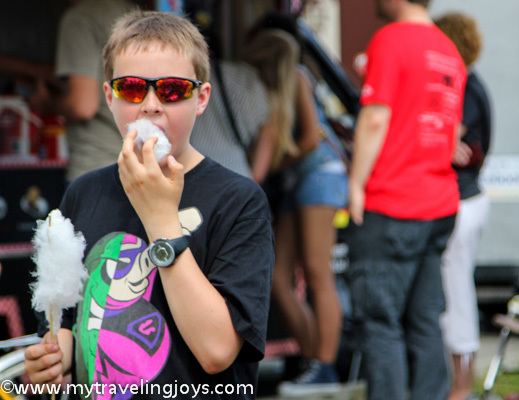 There was Mexican-looking street food such as tacos and burritos from Spoco Loco and Dos Tacos. Local DJs played upbeat music to the hundreds of festival participants. Funny enough, the loaded baked potatoes reminded me an awfully lot like Turkish kumpir, but the grilled kielbasa and zapiekanki, a toasted baguette with cheese and toppings, were all Polish. Hope you enjoy these photos from Warsaw! Smacznego! I bought a round of local herbed goat cheese from this food vendor. 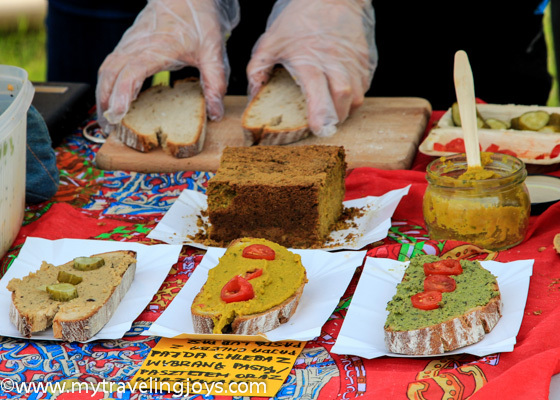 Polish pate on homemade bread. Fried Polish pancakes served with sour cream and dill. Lots and lots of Polish sausages and cured meats. I must say that I really miss polish foods, especially bread.. but two weeks later I will be in Poland which in general does not make me happy. 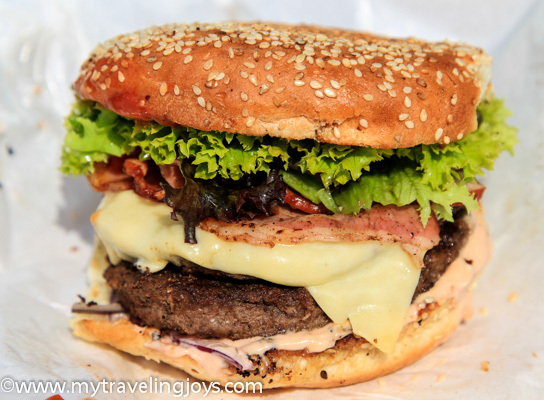 Burger looks not so good, no crispy bacon (they don't have apple wood smoked), swiss Polish cheese, lettuce semifrisee no Heinz ketchup, no Frenchy's mystard (my bet). Polish food is disgusting, and their take on international food allways take favorite flavors away. I was in Scotland last week and chose to buy the Polish bread in the local supermarket as it was vastly superior to the UK versions on offer. I'm now a convert. 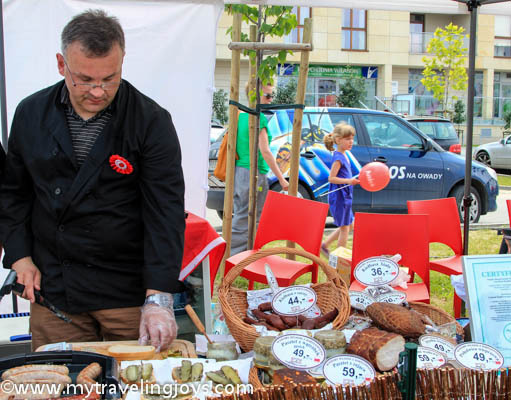 Can you find some recipes for Polish bread? i sure wish i could have gone to this with you! 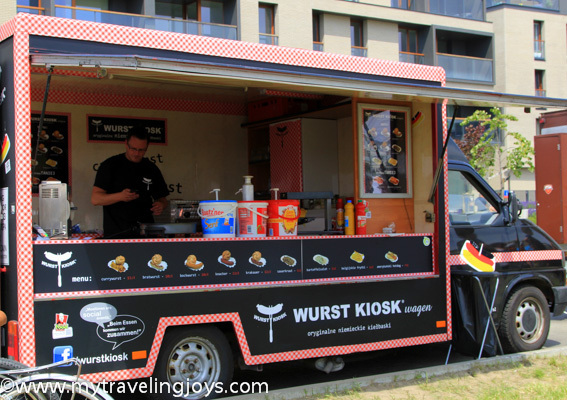 the wurstwagon would have been mine! and the potato pancakes. and the pate'. oh well..i will live vicariously! i hope you aren't too lonely? it is tough for a while. i remember crying in the produce aisle once and then then thinking people must find me crazy! @Vixen, I do love the Polish bread! And must be careful not to eat it all to avoid the extra kilos. Safe travels! @Anonymous, I'm sorry you feel like that. Sure, the bacon wasn't crispy, but the burger was still tasty. Overall, we've been quite happy with the international food here as it's not near the same bastardization as it was when we lived in Turkey. @Annie, Yes, the Polish bread is very, very good! I love the rye and all the whole grains in them. I will try and find some recipes. @Joyce, Oh, the festival definitely would have been fun with you here! ;-) Just going through a lil rough patch, but hanging in there. Still missing your wonderful Istanbul posts, Joy. 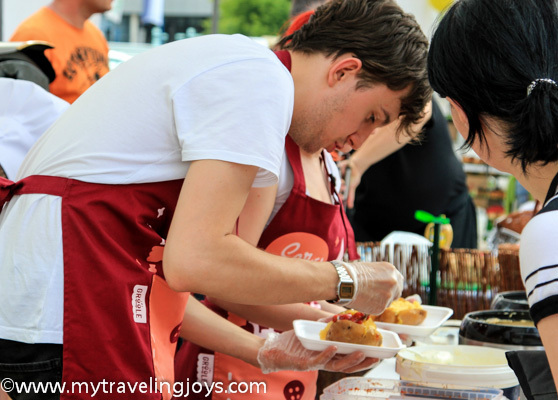 This food festival looks fun though! 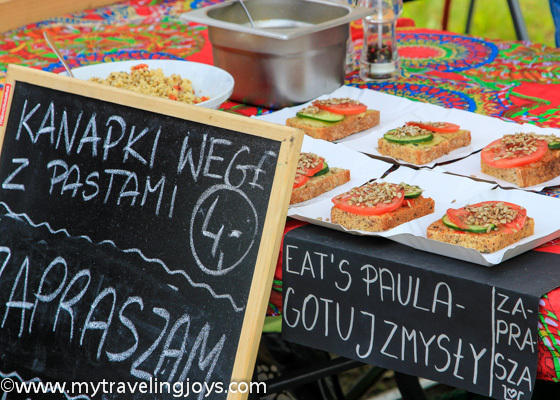 Joy, always love seeing market photos in different parts of the world, thanks for sharing all these - I loved the look of the open Polish sandwich, yummy! @Ozlem, Çok teşekkürler! The Polish bread here is sooo good! 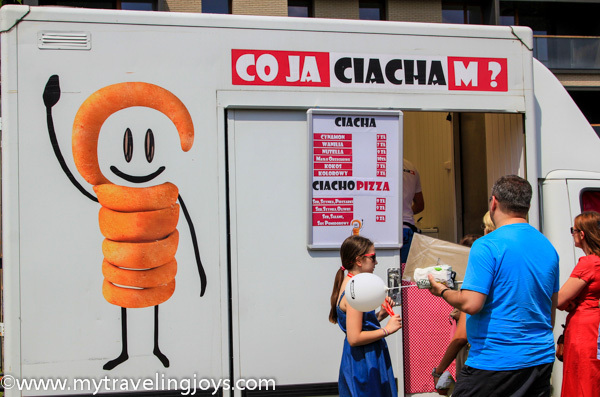 It's fun to see what different foodie things there are in Poland. Oh what fun! 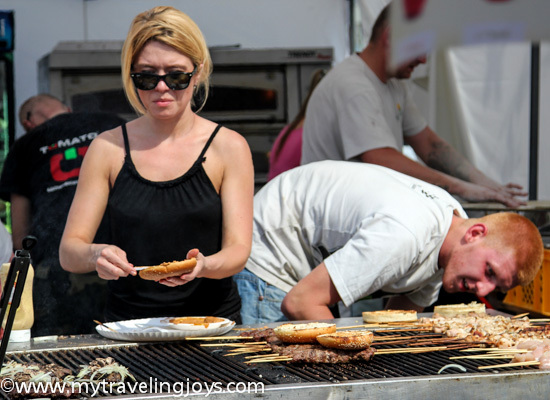 I wish the food truck craze would hit a city near me! That buger looks GOOD.